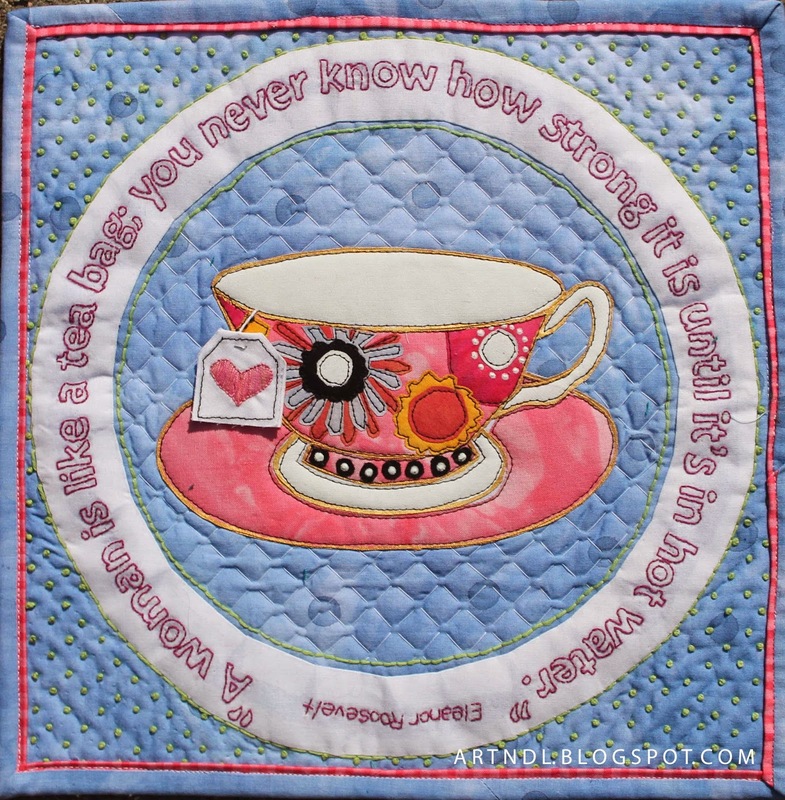 My favorite quote is from Eleanor Roosevelt, "A woman is like a teabag, you never know how strong it is until it's in hot water". 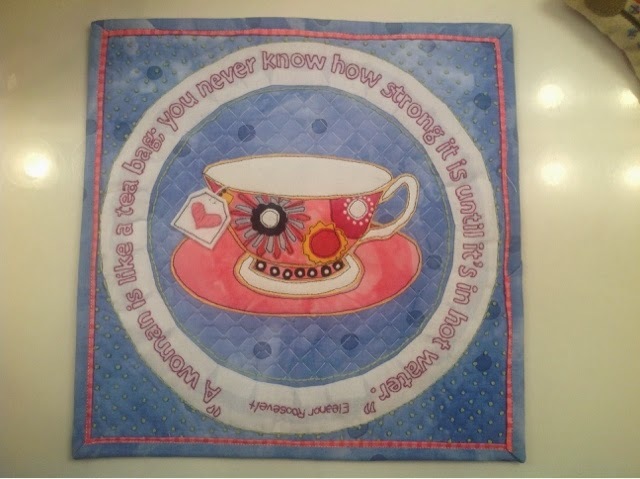 I began with white fabric that I used Jacquard's color magnet on by making a dot pattern with the pen. When I dyed the fabric with periwinkle dye, the dots become darker than the rest of the fabric. I hand embroidered the outlines of the letters for the quote. My teacup and its flowers are machine appliquéd with some puff-paint accents. A fine China teacup usually is gold rimmed, so I thought it fitting I trimmed the entire teacup, saucer, and handle with gold paint. Finally outside of the quote's circle, I did a pattern of French knots. Inside of the circle I did a diamond hand quilting pattern. One of the niftiest parts of this 12" x 12" quilt is the binding, it's the first binding I ever did that was entirely machine sewn with no handstitching needed. This challenge was fun! Thank you Margaret for such a good idea! I had an idea as soon as it was announced and have no reason to be late, except that life gets in the way around here! 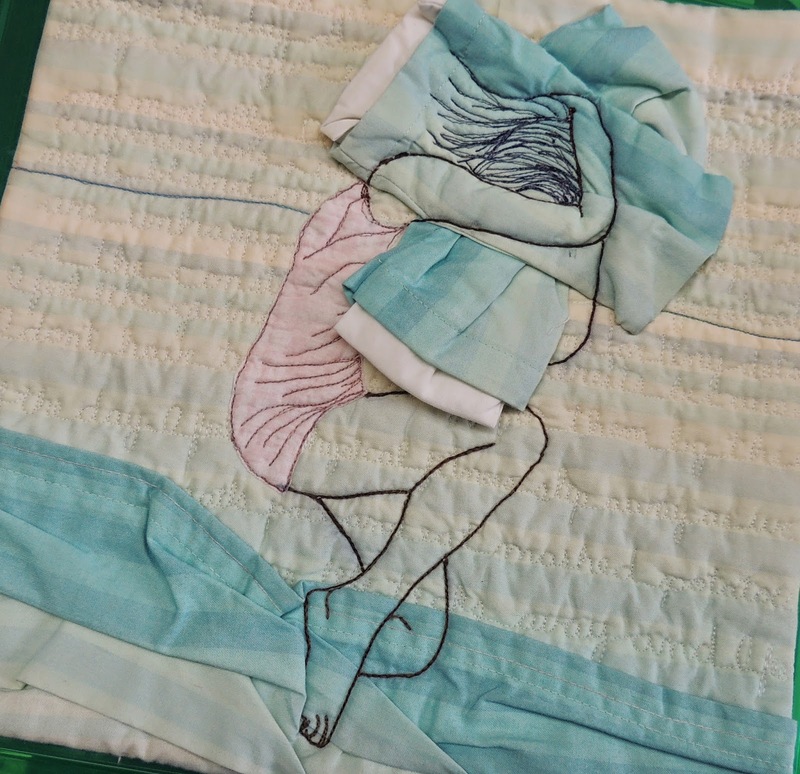 This piece is quilted with what would amount to a journal page of words in the lines between the stripes on the bed sheet. I chose non contrast thread so that it wasn't immediately as negative as it actually is. In doing this piece I discovered the cathartic effect of writing down what is bothering you at the time. But it's done discreetly so nobody is hurt. Words you might find are: "mashed potatoes, clockwork mouse, repetitive stories, senior pace, dreams, and caregiver". You can get the general idea from that. First I quilted the words onto the sandwich. When that was done, I arranged the rumpled sheets and made two little pillows. These were arranged on the "bed" and the drawing placed over them with pins and some hand stitching. I then thread painted on top of my drawing (done on soluble). Why I did that I have no idea because it meant getting the project wet afterwards to get it all off! If I had used tracing paper I suspect I'd have had much better results. The thread used is Aurifil Wool so that it gave a softer look to the drawing. Her clothing was applied in a sort of "collage" manner. I think if one had the patience to do it, you could hold this in front of a mirror and read most of it. Here is a photo of the back. As with everything I do, I would do it differently if I were to do it again! But it was a good learning experience and I did accomplish my goal to produce a 3D project. At least I think it is! What is the difference between 1 dimensional, 2 dimensional and 3 dimensional? Does anyone know?